Posted on December 16, 2016 at 3:28 pm. Arnold Drury was born on the 26th of November, probably in 1897, in Eckington, Derbyshire. Later in life he seemed to think he was born in 1898 but earlier records say 1897. His parents were Ellis Drury and Rhoda Jane Wright. By 1901 the family had moved to 28 Warden Street, Rotherham so Ellis could work in the mines. Arnold had 2 older siblings, Charles and Mabel, and in Rotherham he had a younger brother, Sydney Ellis Drury. Arnold attended Anston Church Of England Boys School until at least 1906, unlike most other students he didn’t opt out of religious teachings. By 1911 Ellis had been promoted to colliery deputy, so the family had moved to 54 Cambridge Street, Rotherham. Arnold had started working as an errand boy for a clothier. In 1915 the family lived at 8 Canklow Terrace, Rotherham, Arnold was 17 and working as a butcher. On the 31st of May Arnold lied about his age to join the military in Doncaster. He still had a boy’s frame at 5 foot 8 tall, just under 10 stone in weight, and a chest size of only 34 inches when fully expanded. It should have been clear that he was underage, but the officers may have turned a blind eye. He also had slightly flat feet and although his physical condition was considered poor he was deemed fit for service. Arnold served in the Royal Field Artillery, in the 3rd Brigade of the ‘second line’ of the West Riding Division. For 2 years the most exciting thing to happen was an inspection by King George V in July 1916. On 7th January 1917 Arnold was shipped to France. He had spent so long training in England he was actually old enough to fight! He served as a Driver, a rank equal to Private, that usually involved driving the horses that pulled guns. At the end of the war it is likely many of the horses he worked with would have been sold to Belgian butchers as meat. In May of 1918 Arnold had problems with appendicitis and was classified as 30% disabled. 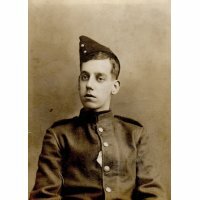 He was transferred home and on the of 5th June 1918 was admitted to Sunderland war Hospital where he made a quick recovery. He served much of the rest of the war in Ripon, Yorkshire. In France he had got into trouble for being late to an early morning parade, he continued the pattern in Ripon by turning up to the Colonel’s Parade unshaven. He was confined to barracks for 3 days! He also turned up to a later parade in civilian clothes but was only told off for it. He received the War Medal and the Victory Medal, and was discharged on the 27th March 1919. Many of his later papers feature his actual age, hinting the army put together he lied. In 1921 Arnold married Mabel Mee in Ecclesall Bierlow, she was a few years older than him. They had at least 5 children, including: Mabel, Graham, Beryl, Sylvia, and Hazel. In 1939 they lived at 13 Park Avenue, Doncaster, Arnold was the manager at a butchers shop. Throughout the 30s most butchers in Yorkshire stopped selling horse meat, but by 1941 Arnold sold it at a shop on Silver Street. Going by the French name ‘Viande Cheval’ it was surprisingly popular, though often mistaken for beef. On Fridays there were long queues for the rendered horse fat as it could be used instead of butter in baking. On series 11, episode 4 of the TV show QI, Arnold Drury was named the last butcher to serve horse meat in England. Arnold was living at 41 Northfield Road, Sprotborough Road when he passed away on 20th April 1951. He left his wife just over £400, though she was more than 6 times richer when she died on 15th May 1952. Arnold’s shop reputedly traded until 1955, and a Drury, E and Sons butchers operated on 5 Cleveland Street as late as 1957. Arthur Champney served with the Army Veterinary Corps during the First World War.